Very quiet, isolated house. overlooking the Ventoux and the Laces of Montmirail- Large living room, large dining room. - Bath and shower. - Open garden. - Cave closed .No available light or noise pollution, you only hear the wildlife of the surrounding countryside and will discover the beauty of the starry skies of summer with shooting stars: Dream evenings! The round and playful pool is 50m in diameter to 5. 1. 20m deep in his little sunny outdoor theater .The safety is ensured by a barrier standards for smaller and non-swimmers. Barbecue charcoal allows for good grills, it is close to the open veranda that protects you from the north wind prevailing in this region. Often criticized, it has the advantage to cool off during hot weather and he quickly chases the clouds when there! We've spent a nice holiday at Les Artaux. 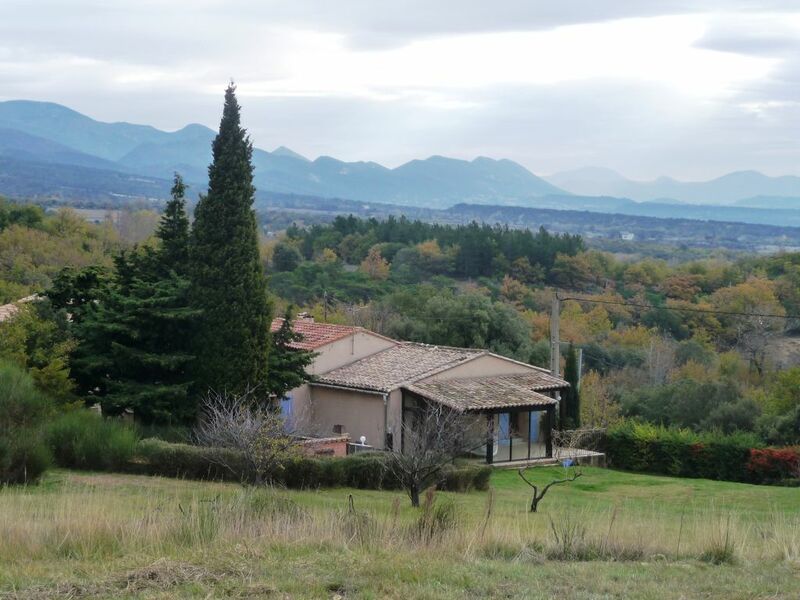 I liked the large open space around the house and the wonderful view all the way to Mont Ventoux. With its remote location 3 km from the village of Salles sous Bois, the house offers a lot of privacy without being isolated. From the garden you can directly access an extensive forest with good hiking possibilities. We also brought our road bikes and enjoyed a couple of lovely (but challenging) rides out in the surrounding countryside in the morning. The pool area in the garden, although limited in size, was perfect to cool off and to relax on lounge chairs shaded by a big parasol. Within a short drive there are several very charming towns, such as Taulignan and Grignan, surrounded by vineyards and olive trees. Also the Rhone valley is not even a 30 minutes' drive away. We were lucky to be there in early July, when the lavender fields are in fool bloom, providing beautiful views and smells. The owners, Françoise and Olivier, gave us a warm welcome with local products laid out on the kitchen table. They have been very kind and helpful to us. When the dvd player broke down it was quickly replaced by a brand new one. In conclusion: comfortable place, beautiful surroundings offering a wide variety of interesting places and activities, and a friendly and reliable host. Très bon sejour, une grande maison agréable avec une piscine qui fait le bonheur des enfants et des grands. Maison familiale, un jardin appréciable. Bon accueil. Un côté champêtre qui fait du bien lorsque l on vient de la ville, les paysages sont magnifiques et la situation géographique de la maison est idéale pour rayonner aux alentours. Très bon séjour la maison est agréable et bien équipée. Enjoyed staying at this beautiful typical french renovated farmhouse very much. It's comfortable large and quiet. Very generous and friendly owners. It has a large, very well kept, garden with lovely views, relaxing garden/pool furniture and a refreshing (small) pool. A partially covered terrass with sliding doors that, when closed, protect you from the wind (if needed) and also allows a refreshing breeze when temperatures rise. Highly recommended. Een mooi huis met een wijds en fantastisch uitzicht! Huis is lekker ruim van alle gemakken voorzien (oa afwasmachine, wasmachine) en een lekker zwembad! Een veranda waar je heerlijk kan zitten. Ook mooie omgeving. Zeer vriendelijke verhuurders en staan voor je klaar als er iets is. Kortom we hebben erg genoten. La maison est très agréable, propre et fonctionnelle, et l'accueil des propriétaires est excellent (extrêmement gentils et attentionnés, sans être intrusifs). La présence des animaux du voisin est un plus sympathique pour les enfants. Le coin piscine est charmant. Nous avons particulièrement apprécié le calme de cette location. Nice view of the plain of Grignan, on the Mount of the Lance, the Mt Ventoux and the Dentelles. House on a hillside between lavender and truffle oaks. LA caution sera rendue au cours du mois suivant le départ ( frais des détériotions constatées déduits ) Un acompte est demandé à la réservation : 25% du montant de la location et le solde est à payer 15 JOURS avant votre arrivée Le ménage est à votre charge , 80 euros seront retenus sur la caution s'il n'est pas fait .